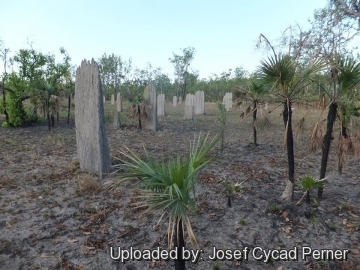 Magnetic Termite mounds with Livistona humilis on the Stuart Highway south of Darwin in the Northern Territory of Australia. 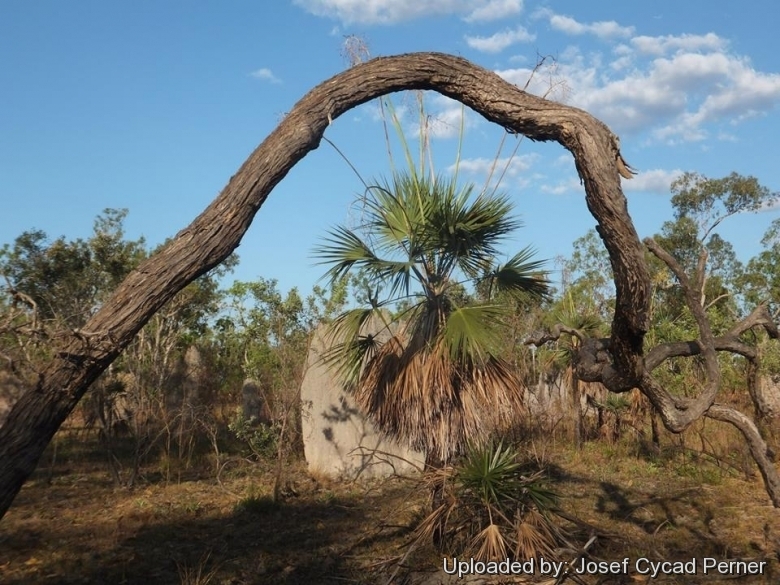 Origin and Habitat: Livistona humilis is confined to the the higher rainfall areas of the Northern Territory, north of the Fitzmaurice River in the west and the Roper River in the east but seemingly absent from the Katherine - Mataranka area. It is the most widespread plam species present in the Northern Territory. Type locality: Australia. Northern Territory. Gulf of Carpentaria, Blue Mud Bay, (Island S) Morgans Is. Altitude range: It grows mostly at low altitude (0-240 metres above sea level). Habitat and ecology: Livistona humilis together with Cycas media are frequent understorey elements that grows in large populations or small groups mostly on sandy soil between sandstone rocks in open tropical eucalypt forest and in woodland (savannah), the ground layer is dominated by annual and perennial grasses. The most common tree species are Eucalyptus miniata, Eucalyptus tetrodonta and Eucalyptus porrecta. The area is frequently burnt. Fires, on average, occur in two out of three years in any one place, but the slender trunk of L. humilis is covered in old leaf bases that makes adult palms quite fire tolerant. The palms will immediately start to produce new fronds if the old ones are burned off or badly scorched. This palm is subject to a hot wet season followed by a hot dry season. Wet season is often subject to extended periods of waterlogging from a high watertable. Dry season temps are consistently around 32 – 33° C, with cooler nights averaging around 15° C or higher. During the transition between wet/dry seasons temperatures are often up to the low 40's and sun intense. It's usually this time of year it flowers, although sometimes it's intermittent throughout. Livistona humilis is so common and little interest is shown in cultivating it in home gardens. Frequently left after clearing, many can be seen on roadside verges and vacant lots. This species will hybridise with Livistona inermis where their ranges overlap. Livistona humilis var. minutiflora Becc. 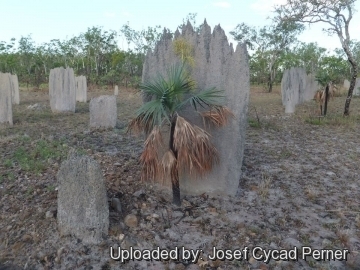 Description: Livistona humilis or dwarf livistona is a diminutive fan-leaved palm, with stiff rather than floppy leaves, and one of the smallest of Australian Livistonas, with a bit thicker trunk and more robust than the even smaller Livistona inermis. Fine in the leaf and slender of stem, this Livistona is much easier to notice when carrying its long panicles of yellow flowers that rise well above the crown. Flowers at only 60-90 cm of trunk height. Stem (trunk):* 1.2-7 m tall , 5-8 cm in diameter, it can exceptionally grow over to 10 metres tall, but don't expect it in your life time. Leaf-scars raised. Internodes narrow, grey. Petiole remnants persistent or deciduous with age or fire. Leaves: 8-15 in a globose crown. Petiole 40-70 cm long, 6-14 mm wide, margins with small, single, curved dark red spines. Segments 30-44, rigid, free for about 3/4 of their length, apical lobes acuminate. Parallel veinlets 6 each side of the midrib. Transverse veinlets thinner than parallel veinlets. Inflorescences: Long, extending far above the crown of the palm. Pollen-bearing (male) and fruit-bearing (female) inflorescences are borne on separate plants and are strongly dimorphic, the female plants have a single partial inflorescence at the apex and the male have several partial inflorescences along the length of the primary axis. Female inforescences: Erect, to 230 cm long, with a single distal partial inflorescence (infrequently with 1-2 lower partial inflorescences) branched to 3 orders. Peduncular bracts 5-8, scurfy pubescent. Male inflorescences: Arcuate, to 180 cm long, peduncular bract lacking; partial inflorescences 4-7, branched to 3 orders, rachillae 3-12 mm long, pubescent. Flowers creamy/yellowish in clusters of 2-4, globose, 1.5-1.8 mm long. Blooming season (in habitat) Flowering and fruiting in winter from May through December. Fruits: Sllipsoid, pyriform or obovoid, 11-19 mm long, 8-10 mm diameter black when ripe. Related species: The closest relationship of L. humilis appears to be with Livistona inermis. Cultivation and Propagation: It is slow-growing palm seldom cultivated in tropical, subtropical park and gardens. It is a uselful but touchy palm and little interest is shown in cultivating it in home gardens. It does well in relatively cool climates (takes frost but can't handle prolonged 'cool'). It is also quite intolerant of being dug up and moved and captive specimens respond only moderately to irrigation and fertilizer. Soil: It does well in poor soil and is adversely affected by high content phosphorus soil/fertilizer. It prefers sandy substrates, but it is adaptable to many kinds of well-drained soils. Fertilization: Need a perfect fertilizer diet including all micro nutrients and trace elements or slow release fertilizer applied during the growin season, or according to package directions, using a fertilizer specifically formulated for palms. Transplantation: Fairly slow growing, they are probably best planted out when palmate leaves develop. Planting the seed directly into their permanent position is a successful alternative. Extreme care is needed when transplanting large specimens as they dislike shifting. Waterings: In cultivation prefers moist soil with good drainage for optimal growth. But it is eventually very drought resistant. It dislikes soggy soils. Light: It prefers bright sunny locations, but it also does well in part shade with some direct sunlight, young specimens should be partially shaded. It will also survive in rather heavy shade but "stretches" to lose its compact shape. Wind resistance: It is fairly resistant to breakage but avoid strong wind. Hardiness: It is cultivable only in tropical and subtropical climates, as it does not stand frost, but for a very short period. Pest and diseases: It is generally a pest free plant. It could however be attacked by mealybugs and scales. Traditional uses: The central growing shoot is eaten. Although it is most sought after during the wet season, it can be eaten at any time. Its removal, however, kills the palm. The “Heart” roasted or baked in ashes, then uncovered, and pierced with a stick. Water is next dribbled into each hole, and the vegetable left to cool. It is finally either beaten up and eaten, or else put into water which it sweetens and is drunk. Propagation: Fresh seeds. The black oval fruit should be cleaned and planted in trays. Germination is slow, taking up to 18 months as is growth. Seedlings develop a very long tap root and don't like this being disturbed and are very susceptible to fungal attack. Weekly applications of fungicide seem essential, plus excellent air circulation.